I have told friends here I am not drinking but they seem to have short term memories. They offer me a beer, I say “no thanks I quit drinking” and the next day they offer me another drink. Maybe they think I meant I quit for the day? I have to ask what was in everything that was offered to me. I even turned down ice cream because I was not in the mood for dairy and later found out someone mixed booze into the ice cream. It seems some people can not live without alcohol but they are not even alcoholics! I never see these people making fools of themselves and they don’t blackout. They control their drinking. It makes me jealous. But I know I will never be able to moderate. I am allergic to alcohol. My body does not react the same. But my body is fine without poisoning it with booze. I met up with my friends P and C that I last saw in June. They were actually the most supportive people from the whole weekend. When someone would offer me a drink, P would tell them “no she doesn’t drink alcohol anymore” before I could say anything. I smiled. I guess it took them a bit to get used to it. But by the time we said bye to each other, we all hugged. I cried. I am happy that I did not lose their friendship like I thought when I blogged about it in June. Also they had another friend with them. I have known this girl for a few years and definitely thought she had a drinking problem. I saw her a few times very drunk and sad in the past. She was a depressive drunk. This weekend she told me she has been sober 4 months. I was proud of her. We talked a little about sobriety. She told me she has a sponsor and is doing AA. I wished her luck. I told her she can talk to me about it whenever. I did overhear about another woman at the festival who did not have a good time. A person said she decided to celebrate her 30 days of sobriety by getting drunk. And I think they said she mixed some drugs with her drinking. She started to have a panic attack, flipped out, and had suicidal thoughts. It made me glad I was sober. After the festival, I spent two nights in a hotel. I walked around the city in the afternoon. Again I wished I was able to drink. Whenever I used to travel and not have to worry about driving, I used that as an excuse to get drunk. I loved the creative names of some cocktails I saw on menus. But I stuck to water. My 30 days, 90 days and 6 month tokens are all coins. This one looks more like a poker chip. I see this as evidence that meetings work different in different areas. Especially my area that only gives 90 days and yearly chips. Congratulations on 9 months!! I love the chip! 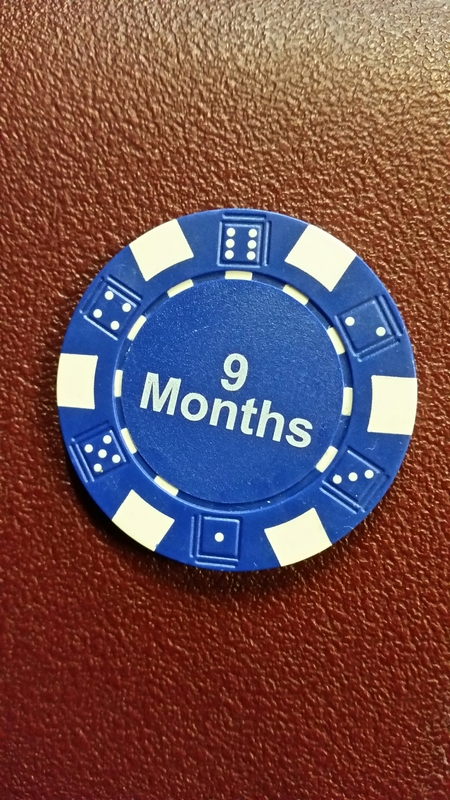 Congratulations on 9 months of sobriety!! You’ve done really well and should be very proud of yourself. Fantastic! Huge congratulations! I was slightly taken aback that the 9 month chip seems to be channelling another addiction, but that may just be my take. I know the chips are hugely important to you, so well done on achieving it.